Perennial pastures have transformed large areas of the agricultural area in south-western Australia. The Department of Primary Industries and Regional Development has published a comprehensive guide - Perennial Pastures for Western Australia, specifically aimed at producers, their advisors, students and the WA agricultural industry, but many of the principles and information is widely applicable. There is a strong interest in perennial pastures due to the growing realisation that farming systems based solely on annual crops and pastures are not sustainable in many regions of south-western Australia. Environmental and management issues facing agriculture include: rising groundwater and the spread of salinity; herbicide resistant weeds; soil acidity and wind erosion. Perennial pastures offer a more sustainable and profitable alternative in many areas. opportunity to rest annual pasture paddocks after the break of the season allowing annuals to develop adequate leaf area to drive improved growth rates. increased perennial cover for waterways. Innovative producers have led the way in demonstrating that the large scale planting of perennial pastures is a viable alternative particularly when addressing deficits within their feed supply, for example, feed gaps. Some producers, particularly those in high rainfall, long growing season environments, are even close to achieving the goal of stock grazing green feed all year-round. Alleys of tagasaste have transformed some of the poorest, deep-leached sands into productive paddocks. Tagasaste provides out-of-season green feed and increases carrying capacity, while also reducing wind erosion and deep drainage. Warm season grasses with companion annual legumes are turning waterlogged land that was previously over-run with reeds into some of the most productive and profitable pasture paddocks in the State. Phase farming with lucerne has created sustainable and profitable rotations with annual crops in medium and low rainfall environments. Alleys of saltbush are being used strategically to keep highly saline groundwater at depth, allowing productive non-halophytic pastures to be grown in the inter-row. Sub-tropical perennial grass based pastures are increasing productivity, while also reducing the risk of land degradation on large areas of sandy soils susceptible to wind erosion on the south coast and northern agricultural region. 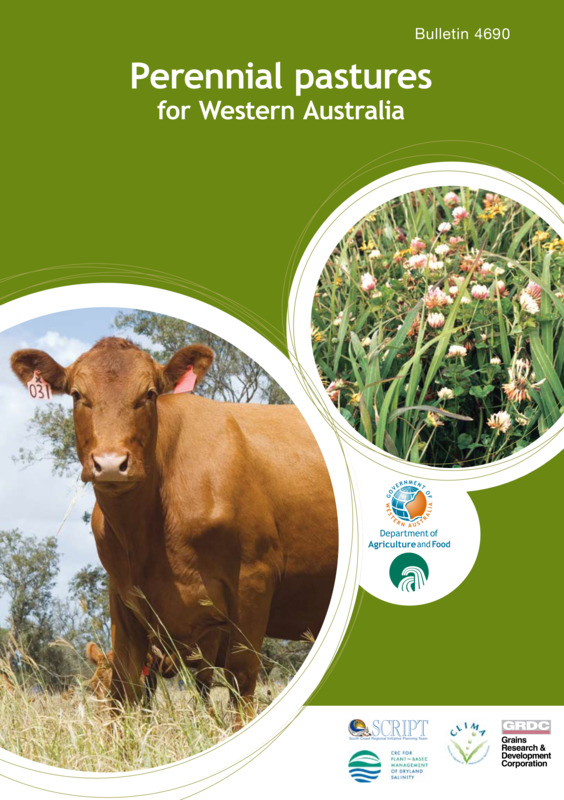 The Perennial Pastures for Western Australia bulletin (Bulletin 4690) is a comprehensive, user friendly guide to selecting, growing and managing perennial pastures in WA. It covers all of the current and future perennial pasture options including: herbaceous perennial legumes, temperate grasses, sub-tropical grasses, herbs, native pastures, fodder shrubs and saltland pastures. For each species there is a comprehensive description on current and potential use, establishment, soil and climate requirements and management. The bulletin also describes the perennial pasture options for each region and perennial pasture management (for example, grazing, animal production) in terms of the potential benefits and disadvantages (for example, animal toxicity, green bridge).